Zucchini plants famously produce high yields, but when this one does, you'll think it's magic! Its semi-spineless vines grow between 1-2' tall and 3-3.5' wide, bearing a huge crop of dark, deep green fruits with a small seed cavity. 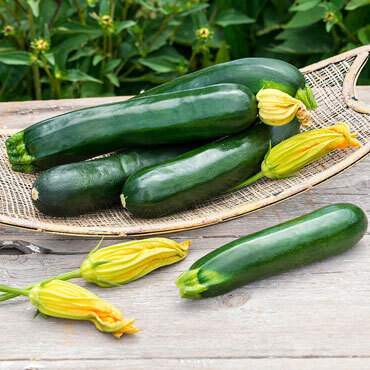 Each zucchini grows between 6-8" with uniformly creamy flesh and a smooth, glossy exterior. They taste terrific, even when picked at larger size--an uncommon feat for zucchini. Slice up and saute with your favorite meat and veggies for a light summer supper, or get out the spiralizer and top your zucchini noodles with sauce, cheese, and meatballs. 50 days to maturity. Height: 1.5 - 2 feet. Zone: Annual 3 - 9. Spread: 3 - 3.5 feet. Yield: 150 lbs./100 foot row. Fruit: Straight, smooth, glossy, dark green skin. Uniform creamy flesh. 6 - 8 inch fruits. Soil Preference: Rich, moist, well-drained soil. pH 5.5 - 6.8.